Matt C: Inexplicably, autumn is almost upon us (did we even have a summer?!) and for the first Wednesday in September there's one new title I think most of the PCG will want to cast their eye over. 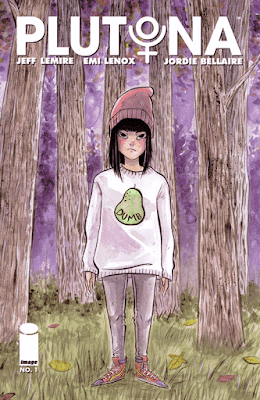 Plutona #1 sees Jeff Lemire in creator-owned mode at Image once more, and when you consider this guy's previous creator-owned output includes the highly treasured Sweet Tooth and the current sci-fi gem, Descender, then you might get an inkling of why we're excited. His co-creator here is "amazing newcomer" Emi Lennox, who - from the looks of the preview art - appears to be employing a simplified art style with an emphasis on expressive emotion i.e. someone who probably has similar artistic sensibilities to Lemire. The story involves a group of kids discovering the dead body of the world's greatest superhero, the eponymous Plutona, and while this isn't exactly a new idea, viewing things from a much younger perspective - and getting into the hero worship angle - should provide plenty of mileage for the creators. A fairly quiet week elsewhere, with the other noteworthy book probably being Daredevil #18. I read somewhere that Mark Waid has now had the longest continuous run on the title, and while I'd say the quality has dropped off since the relaunch, it's still been a good read overall, so I'll be sad to see Waid and artist Chris Samnee leave. That said, the post-Secret Wars Daredevil from Charles Soule and Ron Garney is a book I'm fairly excited about, so it's not all bad news! Stewart R: The first-out-of-the-pile read this week simply has to be Lazarus #19. The last chapter was left on such a surprising cliffhanger that it's difficult to predict just where the story may go from here and what future implications this conflict between clans and family members might bring about over the course of coming months. Will this really be one of those comic book, 'things will never be the same again' moments? Speaking of conflict, there's plenty to go around in other books it seems this week - let's face it, few of our favourite ongoing reads are about friendships, continuous peace, kindness and diplomacy! I'm going to give Brian K. Vaughan's We Stand On Guard one more attempt to convince me to carry on with it as I pick up #3, the previous two instalments offering hints of an involving read with interesting political overtones, but suffering with too speedy a pace for my liking. Jonathan Hickman's Dying And The Dead on the other hand, had me won over following the weighty debut and in spite of delays to the schedule - if you're a fan of Hickman's creator-owned works you know to expect delays from time to time by now - this is a series that I imagine will continue to build to a fine crescendo as it goes. And as I reach the end of this week's On The Pull I guess I'll end with a rousing cheer in BOOM! Studios direction as they once again find three fine titles in my pull-list for the week with the final chapter of Broken World, seventh issue of the terrific, alien world war epic Cluster and the second issue of the impressive John Flood. Bravo to BOOM!